2Bedroom,2 reception House/Bungalow in great location.Beautiful beach just 10min walk through pine forest and sand dunes.Sleeps up to 6-8max 4adults and kids. 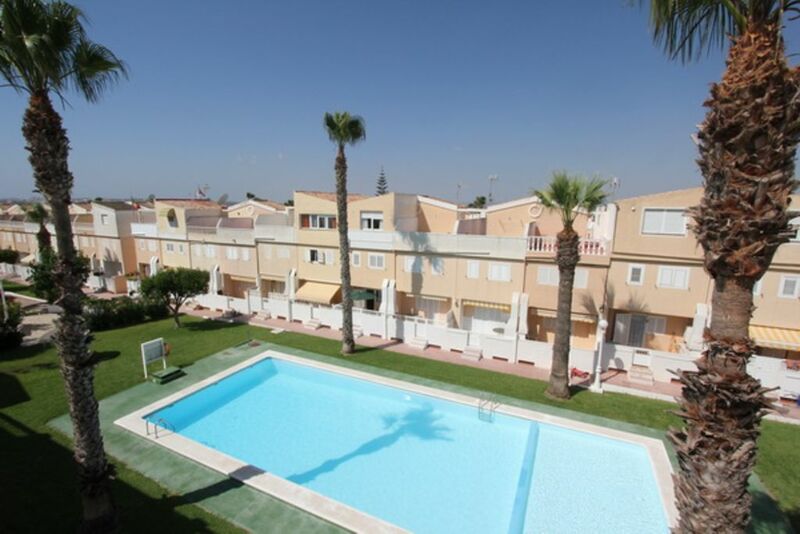 Communal pool outside your back garden.BBQ area,soliarium.Free Wi-Fi,Spanish TV. Bedroom 2- two bunk beds,ideal for bigger families. Sofa bed is extendable to double bed downstairs. Beddrooms have air conditioning,fitted wardrobes. 1st floor Bathroom has bath/shower,wc,bidet,vanity unit.Another wc is on ground floor. Hello,our names are Renata and Algis.We just recently bought this property and fall in love whith location,community,beach and town.We love to travel a lot, but this place feels like a home for us.We just got back and already planning to go back! People are very friendly there,loads of good restaurants,golf courses,shopping centres around.We really looking forward to travel and explore Costa Blanca! Please feel free to ask any questions and we looking forward to welcome you in our house. We bought this property because of location.The best beach in Costa Blanca is just 10min walk threw forest and beautiful dunes,Pool is in your back garden,which is very handy with kids,you can do bbq and watch out your kids,its like your back garden! Roof terrace-great to enjoy days and evenings.We really love it! We saw this property and decision was made-we were lucky in finding everything we wanted and even more! It feels like a home as soon as we get there.The option of having a roof terrace(sun trap),pool in your back garden and sandy beach only 10min walk is a fantastic! At the moment we are unable to get there as often as we would like,as our daughter is 7y,so we would love other people to enjoy the benefits of our house. Lounge has corner sofa,which is extendable to double bed. The kitchen includes:an oven,hob,microwave,kettle.Also washing machine. 2 swimming pools.This year (2018)one of the pools is under renovation. Clean and comfortable property which served its purpose perfectly. Thank you very much for your stay And review. We are very happy you had a great holidays! Hope to see you again!!! Puiki vieta atostogoms su vaikais, kai nereikia niekur eiti is namu, gali nuolat matyti baseine besimaudancius vaikus. Papludimys nuostabus, lėtu zingsniu iki jo uztrukom 15 min. Apartamentuose viskas patogiai irengta, jautemes kaip namuose. Rekomenduoju! Aciu labai už gerus atsiliepimus!tikiuosi apsilankysite dar!!! Puikus apartamentai, kuriuose jautemes kaip namuose, nes radome juose viska ko reikejo. Ideali vieta poilsiui su vaikais, baseinas tiesiai pries apartamentus, neiseinant is namu galima stebeti jame besipliuskenancius vaikus. Nuostabus papludimys, kuri pasiekdavome ne per 15 min letu zingsniu. Viskas puiku, rekomenduoju! Fabulous holidays is a lovely location! We've had a great time on our holidays! The property was exactly as described on the website - a lovely pool on one side and a charming sandy beach (with a life guard!) on the other. The beds were comfortable and the kitchen was very well equipped. We did our food shopping at a local supermarket or a market and cooked most days, so we had everything what we needed. The kids enjoyed the pool which was never crowded and not noisy at bedtime and we could easily keep an eye on them from the terrace. The owners left detailed instructions how to use various appliances which was very helpful and much appreciated. The car is highly recommended for this location (as stated on the website already). I rate this property 4 stars and not 5 because the house was very hot at night with only one AC unit working in one of the bedrooms. The ceiling fans were not enough to sleep comfortably at night or sit downstairs, so we had to use the extra floor fans (provided) which were a bit noisy. Otherwise a great property I would highly recommend. When we came, we was happy.House was big and comfy. The swimming pool just in front the house. Everything was clean.The sandy Beach is close. Nearest town with a lot of fun, pubs, clubs and markets only ten minutes by car. Spanish food,fruits and vegetables was absolutely tasty and cheap.We loved our stay in house Guardemar del Segura and definitely will come back next year!!! Thank you for providing good service. La piscina está a 3m de la salida x la terraza. Está muy bien. La única pega es q hay mucho turismo extranjero. Cleaning charge is 60£ or 80€ payable on arrival directly to house management team.